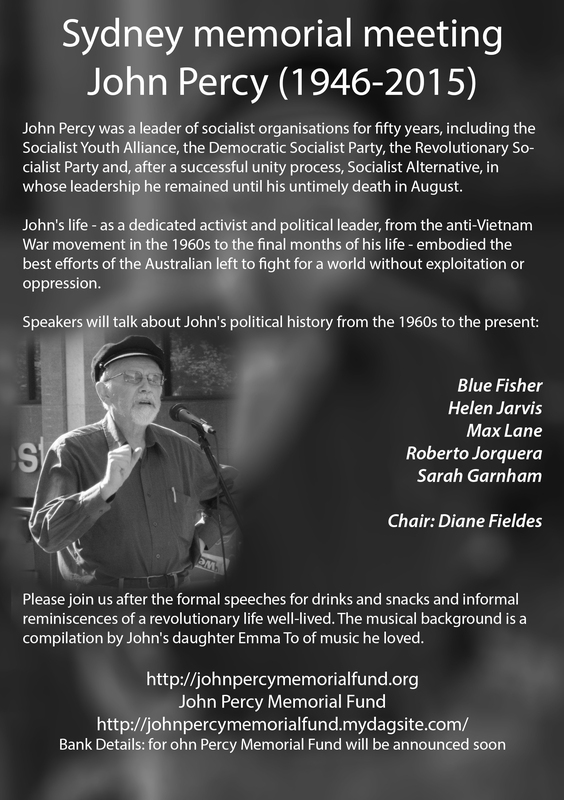 In honor of John Percy, comrades and family have decided to establish a John Percy Memorial Fund. John’s library was extensive and he enjoyed collecting radical posters and propaganda from various campaigns since he first got involved in socialist politics in the mid 1960s. John also loved documenting radical and socialist history and wrote Volume 1 of the History of the Democratic Socialist Party and Resistance. John was in the final stages of the second volume which will be completed by his comrades and published soon. The John Percy Memorial Fund will be established to raise funds to cover some of the costs of the Funeral, help with publication of the second volume of the History of the DSP and Resistance, a memorial plaque for John (in the Domain or Glebe) and help with preservation of his poster collection and extensive library. Donation can be made through the Addison Rd Community Centre. If you would like to donate please contact Roberto Jorquera via email info@johnpercymemorialfund.org or phone 0425182994. John Percy Book Collection and Community and Activist Library in Indonesia. This money will fund the shipment of more than 60 boxes of books and journals to Indonesia, their storage and care in Indonesia until the library building currently being constructed is finished late this year or January-February, 2017. It will also fund final delivery to and unpacking in the Library. September 27, 1995 — Seventy-five years ago, under the impact and inspiration of the October 1917 Russian Revolution, the Communist Party of Australia was founded. It was a modest beginning, but an historic event. The CPA formed in 1920 finally dissolved in 1991, but for most of its life it was the dominant party on the left in Australia and an important force in the workers movement. There are many proud chapters in its history — the numerous trade union struggles led; organising the unemployed, women, Aborigines, young people; important civil liberties fights; and solidarity with international struggles, in Spain, Indonesia, Vietnam, South Africa and East Timor, to name a few. The CPA’s founders had a vision of socialist revolution in Australia, and this was the goal of most of its rank-and-file members over the years. The party inspired dedication and commitment from thousands of men and women, and organised the most militant, idealistic, self-sacrificing section of the Australian working class. You’re a socialist? How could you be a socialist today? How could you be a socialist after what happened in Russia? Isn’t socialism finished with now? Yes, in principle it’s a nice idea, but it doesn’t work, does it? In the wake of the devastating September 11 suicide aircraft bombings in New York and Washington we’re faced with the most incredible, bloodthirsty and reactionary war drive by imperialism led by George Bush, and with Howard and Beazley groveling behind. They’re killing hundreds of ordinary people in Afghanistan at the moment, with millions at risk of dying from starvation, but this war of retaliation is not just aimed at Bin Laden, or the Taliban, or “terrorists”, but at the people of the Third World, all those who have been oppressed and exploited by imperialism. And it’s aimed also at any dissenting voices at home, the movement against globalisation, the radicalised generations who provide an opposition to the capitalist status quo, anyone who looks or thinks differently. And it’s aimed at any democratic gains we’ve won in past decades. I am sad but proud to be saying these few words at the funeral of comrade John Percy. It is difficult however. How do you sum up the life of a man who dedicated his whole adult life – 50 years – to the socialist movement and to the central task of building a revolutionary cadre party. 50 years without a detour or break. Not only is this such an amazing example of dedication to the conviction of the necessity and rightness of this cause, but John contributed so much to actual, real and great achievements. His achievements were those of his party. Many comrades in their tributes have noted how John was never a pushy or limelight seeking leader. One of his most endearing but powerful attributes was they he was able to fuse being himself, able to present his own ideas, with being a member of a team; a leadership team but also the big team that was the party as a whole. He was himself and he was a member. 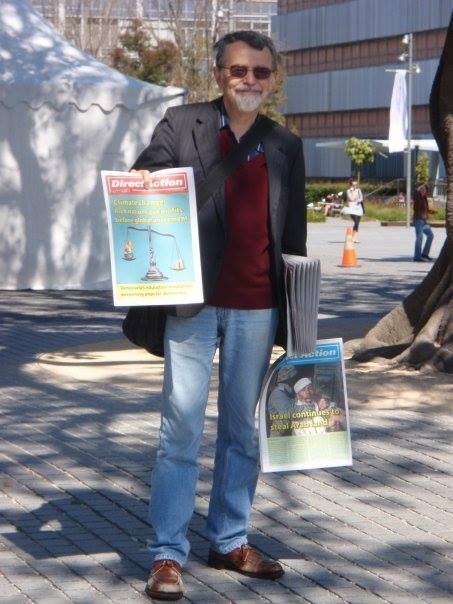 He led by example in upholding a key norms expected of all members – selling the newspaper. And he did this, I can say without doubt, in a way more consistent and exemplary than any other member who ever spent a decent amount of time in the party.